Data Center UPS Market size was valued at over USD 3 billion in 2016 and will grow at over 3% CAGR estimation from 2017 to 2024. Data centers are the major purchasers of UPS systems, as they provide instant power back-up and help enhance the power quality. The data center UPS market is a steadily growing industry owing to the rising demand for battery backup in regions such as Europe and Asia Pacific. Every year, millions of dollars are being spent on the UPS systems which support computer equipment worth millions. Modularity and standardization will drive the installation of innovative designs and the market will witness improvements in the power ratings, decentralized parallel architecture, and more energy-efficient solutions. The industry will witness positive surge from the thriving cloud server demand, which are offering consumers high power in constrained spaces. To address the rising cloud computing demand and acceptance, manufacturers are investing in innovative technologies with high productivity and are providing low total ownership costs. Small data center UPS market dominated the overall industry in 2016 and is witnessing innovations which are focused on enhancing the efficiency. These systems are widely used in BFSI, industrial environments, factory floors, server rooms, and healthcare sectors. The large data center UPS market will grow faster than the global average owing to rise in the data traffic, and growing implementation of cloud based services to serve an extensive base of clients worldwide. These systems have witnessed an enhanced demand from the colocation and telecom & IT sector as these industries require large facilities to manage a large amount of data. Online data center UPS market accounted for majority of the global revenue in 2016 as they provide enhanced overall power protection to the systems and peripherals. This protection includes regulated frequency & voltage, power conditioning, and zero-time transfer to batteries during major power failures. With incoming power being converted twice, during rectification stage input disturbances get eliminated, and load experiences clean and regulate voltage generated by the inverter. The online UPS systems are majorly used for critical business applications in several sectors owing to which a high demand of these systems is being witnessed in the industry. Colocation data center UPS market accounted for a substantial share of the global industry revenue in 2016. Several companies have initiated the UPS-as-a-Service (UPSaaS) trend, which is a substitute way for offering the customers a conditioned, uninterruptible power to mission critical applications. UPSaaS is replacing the legacy approach of acquiring critical backup power solutions such as UPS for the data centers. The trend is based on a fixed kWh rate of electricity witnessed by the market thereby driving the colocation demand. In addition, UPSaaS allows customers to use their revenue more efficiently and is reducing the operating costs related to the electrical infrastructure in the data centers. Asia Pacific data center UPS market is anticipated to witness growth owing to the rise in adoption of data centers in manufacturing and healthcare sectors. Product innovations and online UPS systems for data centers in SMBs and large businesses will fuel the industry growth in the coming years. Asia Pacific will witness high adoption of the green data center UPS systems. Moreover, the rising population in the region, and untapped rural and semi-urban markets will offer the industry lucrative opportunities. However, lack of product differentiation, market maturity, and price competitiveness are hindering the regional market growth. 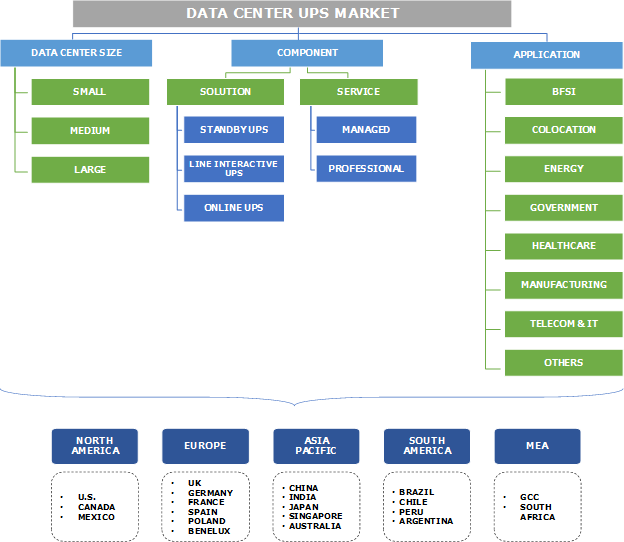 Major players operating in the data center UPS market Schneider Electric S.A., ABB Ltd., Fuji Electric, Tripp Lite, Mitsubishi Electric, Riello, Delta Electronics Inc, General Electric, Controlled Power Company, Ametek Inc., Eaton Corporation, Emerson Network Power, Belkin International, IntelliPower, and Toshiba Corporation among others. The players in the industry are competing based on quality, technology, price, distribution, service and brand. With the rise in competition, strategic alliances such as mergers & acquisitions are being witnessed in the industry, where small companies are being acquired by major players to gain regional or local presence. For instance, Emerson Network Power Inc. and Schneider Electric S.A., recently acquired Chloride Group PLC and American Power Conversion respectively to enhance the company’s revenue and presence for the market solutions. Tier 1 players accounting for more than 50% of the data center UPS industry share and the market is characterized by the presence of several vendors. Slowdown of the semiconductor industry will create a shortage in the inventory supply for data center UPS, thereby hindering the industry growth. The slowdown has been witnessed in China and Taiwan, which majorly serves as a semiconductor hub for manufacturing of UPS systems which are shipped globally. Several companies are offering government, energy, telecom & IT, manufacturing, and healthcare sectors innovative solutions and services by expanding the product portfolio for market penetration.